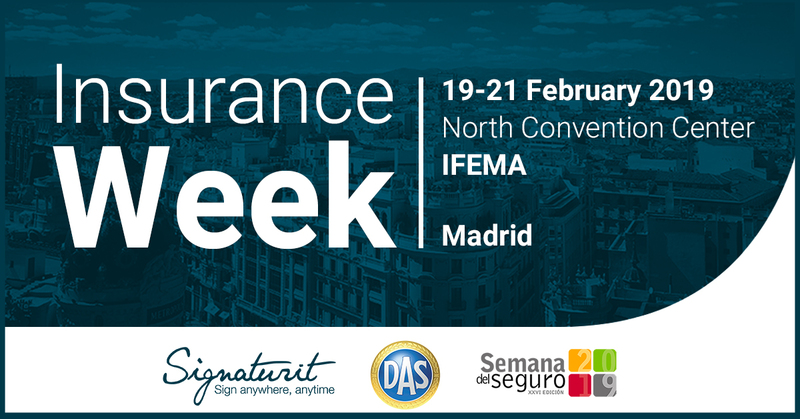 The 26th edition of Insurance Week, or "Semana del Seguro" in Spanish, takes place from the 19th till the 21st of February in Madrid. It's considered the main meeting point of the insurance sector in Spain, bringing together the professionals of the industry. Attendees can join several forums and round tables where the hottest insurtech topics will be discussed. In one of the round tables Head of Legal & DPO at Signaturit Edwin Mata will participate, sharing his expertise in Blockchain technology. Are you curious to know more? Then keep reading and attend Insurance Week! Insurance Week, or Semana del Seguro, will be held from the 19th till the 21st of February and is celebrated at North Convention Center IFEMA in Madrid. The event is organised by INESE and is holding this year it's 26th edition! The objective of Insurance Week is to promote and support processes that improve the insurance industry in all its facets. In order to achieve this, the event will be attended by several insurance companies, professional organizations, broker associations, service companies, consulting firms and insurtechs. Insurance Week will kick-off the 3-day event with its Insurance Senior Management Forum on the 19th of February. The forum is co-organized by Accenture, an international organization consultancy that provides services for management, technology and outsourcing, and has the aim to discuss current trends that can help accelerate insurance companies and improve customer relations. Also the agenda of day 2 and 3 looks promising! Furthermore there will be an exhibition area around the conference rooms where several companies will show during 3 days their product and services to the attendees. The area is also a perfect place for networking! In this 26th edition of Insurance Week, Signaturit will participate as well and in a special way! Our Head of Legal and DPO Edin Mata is invited by DAS Spain to participate in their round table to share his expertise in Blockchain. The round table takes place on Wednesday the 20th of February from 09:00h till 11:00h. The subject of this 2-hour session of DAS Spain will be: "Insurers and Mediators facing the imminence of Blockchain. What does it mean to us?" The session will start with a presentation by Àlex Puig, consultant in innovation and entrepreneur technological, where questions such as: What is blockchain really? What is the potential of it in the insurance sector? What are its possible use-cases? will be answered. After the presentation, the round table will follow with representatives of different companies, Higinio Iglesias CEO of ebroker, a company that offers software for insurance companies, and Chief Executive Officer of E2K which offers value-added services and solutions for insurance brokers, Edwin Mata Head of Legal and DPO of Signaturit and Jordi Rivera CEO of DAS Spain, the well-known insurance company. Together with Alex Puig as moderator, they will discuss the benefits and handicaps of Blockchain and what the challenges are in the insurance industry in order to be able to incorporate fully this technology. Anyone who is interested in attending, can register on the website of Insurance Week and select the appropriate forum of DAS Spain.